The Vatican Information Service last week published the text of a prayer that Pope Benedict has composed to Our Lady of Sheshan to mark the Day of Prayer for the Church in China, which is due to be celebrated on 24 May. "Virgin Most Holy, Mother of the Incarnate Word and our Mother, venerated in the Shrine of Sheshan under the title 'Help of Christians', the entire Church in China looks to you with devout affection. We come before you today to implore your protection. Look upon the People of God and, with a mother's care, guide them along the paths of truth and love, so that they may always be a leaven of harmonious coexistence among all citizens. When you obediently said 'yes' in the house of Nazareth, you allowed God's eternal Son to take flesh in your virginal womb and thus to begin in history the work of our redemption. You willingly and generously co-operated in that work, allowing the sword of pain to pierce your soul, until the supreme hour of the Cross, when you kept watch on Calvary, standing beside your Son, Who died that we might live. From that moment, you became, in a new way, the Mother of all those who receive your Son Jesus in faith and choose to follow in His footsteps by taking up His Cross. Mother of hope, in the darkness of Holy Saturday you journeyed with unfailing trust towards the dawn of Easter. Grant that your children may discern at all times, even those that are darkest, the signs of God's loving presence. 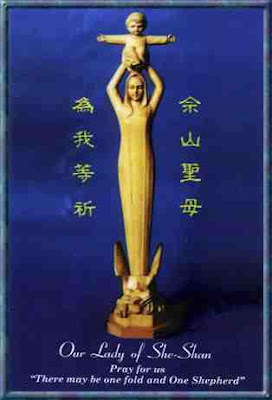 Our Lady of Sheshan, sustain all those in China, who, amid their daily trails, continue to believe, to hope, to love. May they never be afraid to speak of Jesus to the world, and of the world to Jesus. In the statue overlooking the Shrine you lift your Son on high, offering him to the world with open arms in a gesture of love. Help Catholics always to be credible witnesses to this love, ever clinging to the rock of Peter on which the Church is built. Mother of China and all Asia, pray for us, now and for ever. Amen!"